An Act Of Un-Remembrance: 'I will never know anyone but you and I will never know you again' - Jason cannot bring himself to remember the one man he will never forget. Birth: They've fallen down and rolled in the grass and they've even held hands every now and again. Their lives have changed a lot since then, but Howard can't help but notice Jason still can't help coming back. Black: Howard realises that telling him to forget about Take That was the best advice Jason ever gave him, even if, in the end, it only succeeded in leading him round in one big circle. Choreography: Everything they do is choreography. All of it. DJ (I Could Be Dancing): Jason just wants to dance. Green: Jason's reaction to upsetting news is starting to unsettle the rest of the band. Can Howard help Jason the way Jason has helped him so many times before? Hell Raisers: 'If I didn't hold your hand I'm sorry' - Howard Donald's last apology to Jason Orange. In My Veins: Jason and Howard know everything they have is based on the shared understanding that nothing ever lasts. But when Jason tries to disappear again, Howard writes to him to argue a case for creating an exception to their own rules. Insides: Jason has never been fond of flying. Most people try to leave him be, but Howard has a different approach to trying to cheer him up. Last Times: The last time he saw Jason Orange is a lot clearer in Howard's mind than any first time that went before it. Midnight Sun: Howard tries to put his finger on what it is that keeps him staring when Jason turns up at his door in the middle of the night. Parents: Jason and Howard play house when Jason comes over to help with a spot of babysitting. Post-Match Analysis: After the band's football match at Robbie's, Howard tries to relax his aching muscles without anyone finding out just how tired he is. Stay (Oh Darlin'): Companion piece to 'In My Veins'. Jason has read Howard's letter. Now he's written one of his own. Sunset: Howard worries that all the times he let relationships fail in the past have come back to haunt him, convinced that the only relationship he ever truly worked at is slipping away from him and he is powerless to stop it. This: This is spinning around. Endlessly. 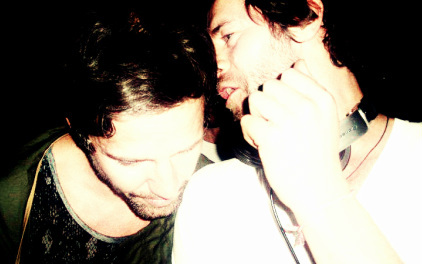 This is Jason Orange and Howard Donald. Twenty-Nine (And A Half): Jason can think of twenty-nine (and a half) reasons why he doesn't care if Howard Donald has left his life forever. Weeks: Just a few more weeks and they'd all be ok again...except they weren't. The disappointment would've been crushing...if it wasn't for that well-timed phone call.